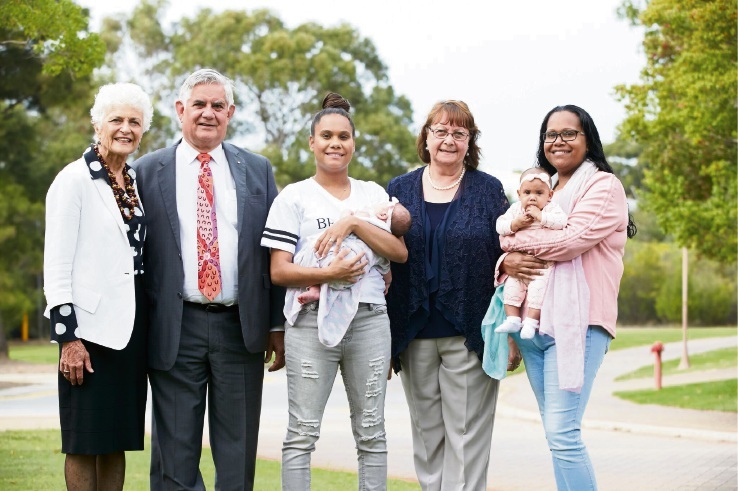 (L-R) Ngangk Yira co-patrons Professor Fiona Stanley and Federal Indigenous Health Minister Ken Wyatt with Nakeisha Moody and baby Zaynah, Ngangk Yira director Professor Rhonda Marriott and Priscilla Moody and her baby Armani. A RESEARCH centre that could “change the life course” of Aboriginal and Torres Strait Islanders has launched at Murdoch University. The Ngangk Yira Research Centre for Aboriginal Health and Social Equity, which the university says is the first of its kind in Australia, will focus on improving health, educational and social outcomes for indigenous families and their communities. It will be led by Aboriginal maternal and child health academic Professor Rhonda Marriott . “To grow strong Aboriginal communities, we must start at the beginning by supporting mothers and families every step of the journey from pregnancy,” she said. University vice chancellor Eeva Leinonen said Ngangk Yira had the potential to transform communities. “We will be pioneering the practical changes that will change the life course of the next generation of Aboriginal youth and informing key changes to state and national policy, practice and education to support these outcomes,” she said. Projects underway include a program providing mental health screening for postnatal depression, and a long-term study to understand factors affecting the wellbeing of youths.